For a large swimming pool complex, high winds and cool temperatures outside make thermal efficiency targets that little bit harder to attain. Add in the need to maximize the amount of natural light poolside, and achieving required heat gains presents a challenge. Translucent Danpalon® façade systems are providing building designers with an elegant solution. Pachuca in Central Mexico is a very windy city and by Mexican standards is also quite cold, with an average temperature of 16ºC throughout the year. 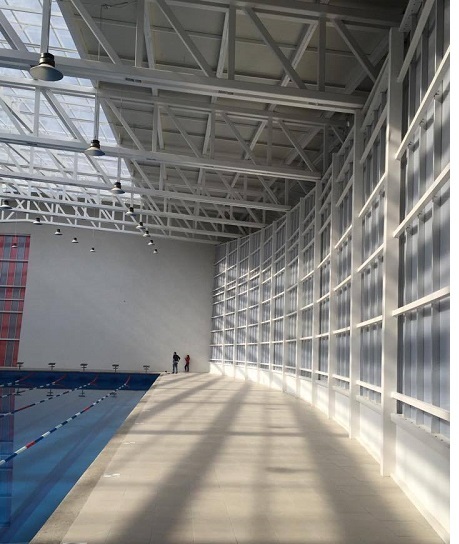 When Alberca Universidad Politécnica Metropolitana came to rebuild its swimming pool complex the building’s thermal efficiency was a key design criteria. At the same time, the project needed to reuse as much existing infrastructure as was possible. With the swimming pool then largely determining the building’s orientation, façade design played a vital role in maximizing natural light and heat gain on the inside while handling the high winds on the outside. The architects, Instituto Hidalguense de la Infraestructura Fisica Educativa (INHIFE) also had to face the challenge of building in sandy soil conditions that offered a relatively low weight resistance. With the weight and movement of the swimming pool being a significant part of the structure’s overall loading, the use of lightweight façade materials was vital. Turning to translucent Danpalon® polycarbonate façade systems, the INHIFE architects found an aesthetically pleasing and technically robust solution capable of meeting the project’s competing demands for light diffusion, thermal insulation, physical strength and low material weight. A full-height Danpalon® façade constructed using 16mm Ice panels runs the complete length of one side of the swimming pool on a steel frame, while a further Danpalon® façade using a combination of 22mm 3DLite metallic grey and red panels sits at one end of the pool. The new swimming pool complex is a unique wedge-like form composed of gentle slopes, elegant curves and striking lines. 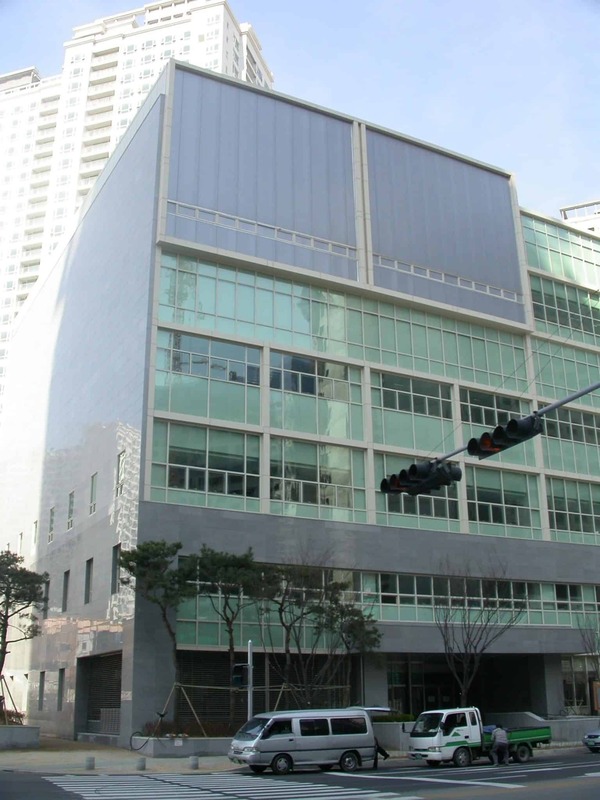 A heightened façade wall to increase the natural light diffusion and enable optimization of roof span and pitch was aided by the use of extra long Danpalon® panels, which also avoided the need for horizontal jointing. Panel installation was rapid, taking just a few days from delivery to completion. If a company is going to make its mark in the competitive building industry, it must be innovative. The changes that technology has made in the twenty-first century have altered virtually every aspect of our life, and that’s as true in the building industry as it has been in other areas. Danpal, with its 50 years as a leader in developing building materials that are designed to meet both the immediate needs of the client as well as the broader needs of a sustainable world, knows how to deliver satisfaction on a multitude of levels. First, never skimp on quality. The customer must be confident that the products used in a building are superior so that they will perform their function to the utmost. Second, the products must be able to do their job. In order to last, a building must maintain its strength and integrity. Third, a product must support the energy efficiency standards that are cost-effective for the consumer and environmentally friendly for the planet. And last, but not least, a product that is part of the visual appearance of a building should enhance its esthetics. We’re proud to say that polycarbonate sheets meet all of these requirements. Innovation and advances and technology mean that building materials that were popular in a previous generation are no longer capable of matching today’s products. Polycarbonate sheets are half as heavy as glass, but 200 times stronger. 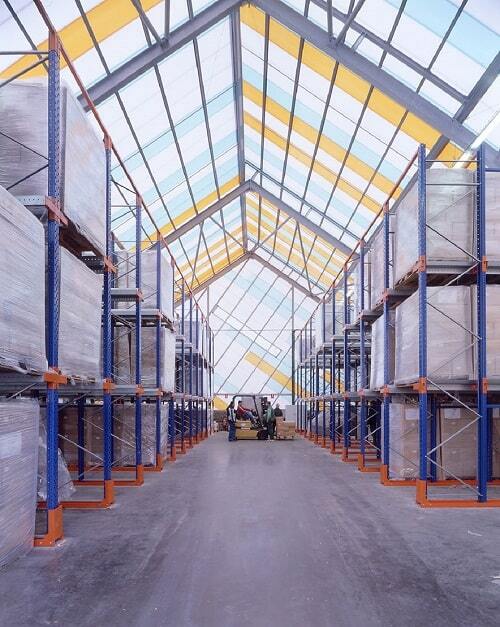 In addition, polycarbonate sheets are more flexible than glass. You can see the advantages of this trait; flexibility means that polycarbonate sheets are easier to install and customize. If a building’s components are functioning as they were designed, energy efficiency is assured. When insulation remains dry, energy isn’t going to waste. Your building is using just the amount that’s needed to keep the inside comfortable and free from moisture. That represents a financial savings for you, a structural savings for your building, and an environmental savings for our world. 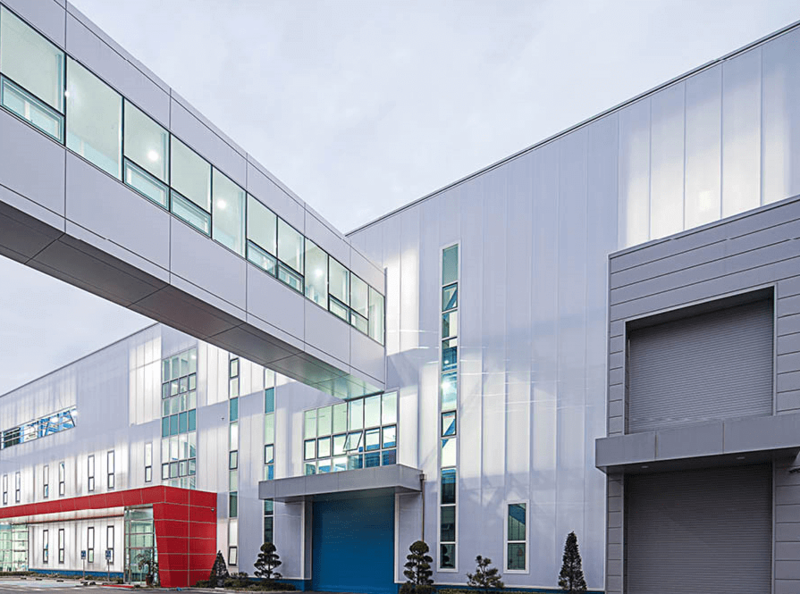 Whether you choose multiwall polycarbonate, which is a structured sheet made of hollow air chambers, or solid polycarbonate, which is clear, flat sheeting that resembles glass in appearance, you’re choosing a product that offers superior performance. Both multiwall and solid polycarbonate are equal in performance, so in the end, you’re going to choose the polycarbonate that suits the appearance you’re looking for. Speaking of Appearance . . . Earlier, we told you that appearance is an important component of the Danpal products that are visible. We’re known for the way that we’ve incorporated light into the architecture of a building, and polycarbonate sheets are included in the Danpal daylight options. We can’t take credit for using daylight as a building material, but we can take credit for creating systems and products that make it easier to include natural light as part of the interior design of a building. With the natural light that comes from Mother Nature, and the color options that Danpal provides, buildings don’t just offer a structural presence; they provide a creative one as well. Danpal® offers a range of single glazed translucent facade systems for architects and designers. In this article, we’re going to discuss the beneficial elements and all the advantages of using those products. Hopefully, the information will assist professionals in making the right choices. These solutions are much better than glass for a variety of reasons we will discuss in just a moment. Also, they’re cost-effective and environmentally-friendly due to their long-lasting nature. 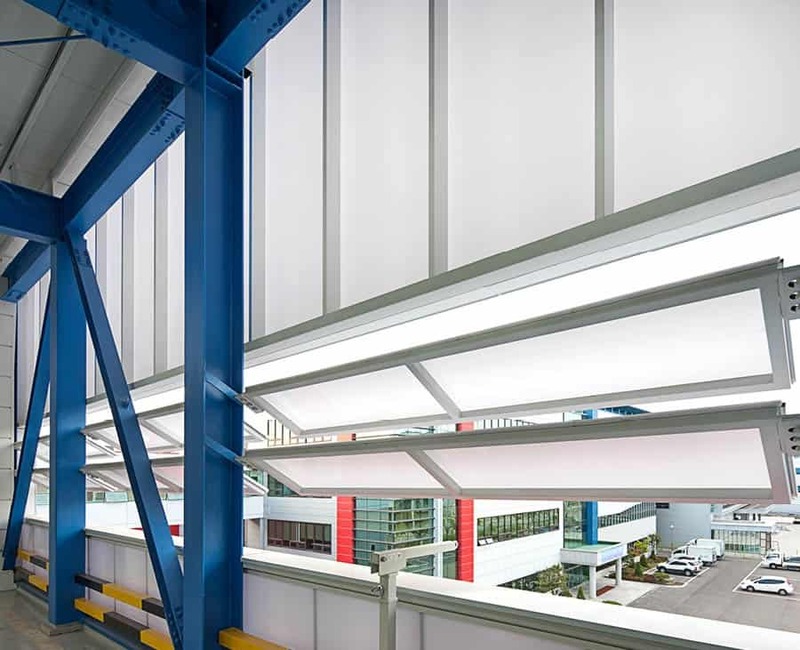 Our items can assist in delivering the perfect balance of light into any building. Alongside other advantages, those who opt for our facade materials will benefit from weather protection. The products also offer excellent resistance to the impact of hail and other projectiles. They are designed to expand and contract as temperatures rise and fall. So, they won’t crack or break like many inferior solutions on the market. They offer super flexibility that ensures they will stay in working order for many years. That is the primary reason architects and designers around the world turn to use when looking for the best facade solutions. The optimal balance of solar and thermal dynamics isn’t easy to achieve, but our products help to achieve that goal. Leaks and damp can cause many issues for designers and architects. For that reason, we wanted to create a product that eliminates those problems entirely. Danpal® facade materials do that without breaking the bank. The snap-lock connection system ensures air and water cannot penetrate into the building. That means concerns relating to damp are no longer an issue. If air and water can’t get under the materials, owners will never encounter that hindrance. When selecting cheaper solutions, the same isn’t always true. That is why many people have to replace their products sooner than they otherwise would have done. Our team understands that designers often want to ensure all elements of their buildings match. For that reason, we offer a broad range of different colours, textures, and finishes to suit any job. The products will illuminate by day, and turn into light boxes at night. To see a full range, just take a look at systems section and Download link on the top. There are brochures available that cover all the ins and outs. Once you’ve done that, it’s time to get in touch with our team to discuss your requirements. We strive to provide quotes and deal with requests as quickly as possible. So, you won’t have to wait around too long for a reply. Our unique facade materials provides architects with an endless source of creative possibilities. Compared to many competitors, we offer superior products made to cutting-edge designs. We also employ the latest microcell technology to ensure everything we supply meets requirements. If you need a product that’s stylishly created a build to last, look no further. Contact us today, and let us know how we can assist. A distribution oriented line up: Considering the easy access for shipment, the working area is located on the 1st and 2nd floor to facilitate the flow of working. So it enables to do stocking, assembling, testing, and shipping products on the ground floor. Employee parking lot is on the 3rd floor (top floor). Environment-friendly material for façade, Danpalon: Danpalon, which is a semi-transparent polycarbonate system made of 6 layered panels, can maximize daylighting effect by spreading light through diffused reflection under the daylight and save energy by decreasing the amount of CO2 produced by artificial lighting. With its excellent quality and amount of lights, it doesn’t create shadows inside from the structure as it provides even diffused light instead of direct light so productivity and safety of employees can be maximized. After sunset, the light inside of extension building is spread outside creating the image wall representing GST so it gives symbolism to building on Dongtan industrial complex 6gil as a lighting box. Communication and connecting spaces: It is planned to connect existing building and extension building by using a bridge as a medium. External space: Cooperative company area and reception area are separated while exit and entrance are combined to unify them as one building. Based on our experience in building extension plant of GST, we would like to make a new design guide (Danpalon) for building a new plant considering environment-friendliness, convenient construction, light structure and various lighting by studying interior as well as exterior space design. 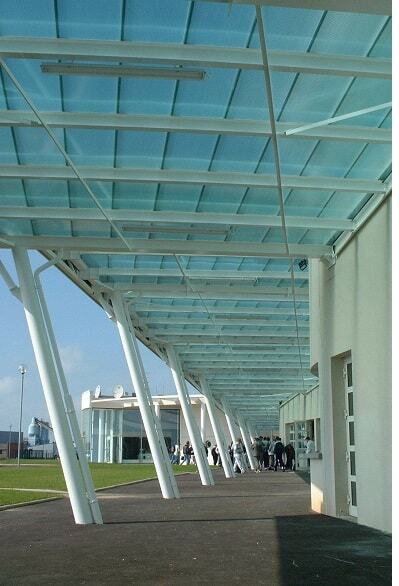 What does the future hold for polycarbonate panels? In the past few years, polycarbonate panels have transformed the construction industry. This is thanks to the wide range of features that they brought to the table including ease of installation, energy efficiency and increased design options. This has made the lives of developers and architects a whole lot easier, as there are more choices to choose from and the overall finish of the structure is closer to what was idealized. 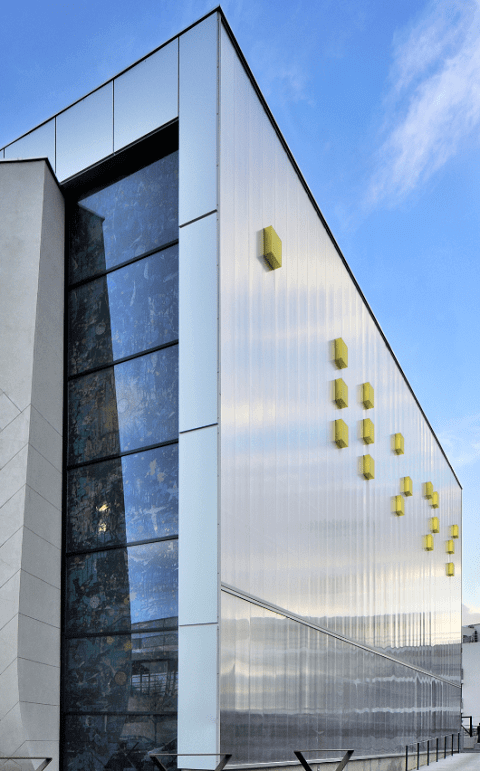 While polycarbonate panels may initially be a bit more than the traditional materials that were used when constructing the facade of a building, in the long term they are going to save you money. This is why the use of these panels is going to grow and grow into the future. We are moving into a time where energy efficient materials are going to trump everything. Energy costs are set to rise into the future, so having a structure that is as energy efficient as possible is going to be a top priority of all developers and hence designers. This will save you money in the form of energy costs into the future. With climate change becoming more of an issue, more extreme weather conditions will very likely be experienced across the globe. This means that structures may not be ready to withstand the effects that these conditions will have on them. Excess rain and wind can cause damage to the facade if subpar materials are used, leading to leaks, structural damage as well as a whole host of other issues. Polycarbonate panels can be easily installed onto a structure, so they are a quick yet effective solution to changing climates. They are resistant to extreme weather conditions and you will not have to be spending heaps of money repairing them. Currently China is the biggest market when it comes to polycarbonate and this looks set to grow even further into the future. As the Chinese economy develops, more complex designs will be implemented on structures as there will be more money to throw at the construction of buildings, rather than only worrying about the cost of them. This is a trend that will exist throughout the Asia-Pacific region, especially as the wealth of the population increases. Our range of polycarbonate panels at Danpal have been carefully designed and are constantly being tweaked in order to stay up to date with the latest trends and research. You can’t go wrong with using our products to ensure energy efficiency in your structure. The benefits of daylight when it comes to the design of structures cannot be underestimated. It helps to generate energy savings, reduces costs in the building process, can potentially increase productivity, is sustainable and enhances the mood of people inside of the structure, to name just a few things. This is why architects have daylighting as one of their number one priorities in the design process. While there are many skylight makers and manufacturers on the market, none of them quiet have the end product that is like the Danpalon glazing system, which has been built for the future. The climate of our world is ever changing and with that comes the importance of having all aspects of your structure being fool proof when it comes to the various weather conditions that the structure will be exposed to on a daily basis. You don’t want something that looks great and performs well in the short term, you need something that is sustainable, low maintenance and will retain its appeal even years into the future. The balance between having glazing materials that are energy efficient, as well as being durable can often be a hard one to find. With construction looking to explode in the coming years in fastly developing countries, especially in areas of Asia like China, there is going to be a much greater demand for these types of materials. Especially as they are becoming more aware of the effects different materials can have on global warming, as well as the money savings they can achieve into the future. The main aspects of a system that architects will be looking for will be a large thermal mass that can absorb the heat during the day and release it at night, look at different systems to compare the exclusion of solar gain, have systems that are completely air tight so as to exclude external hot air and high insulation levels in order to keep heat gain to a minimum with the building’s fabric. As temperatures rise, the shading and glazing of a system are going to become vitally important. Shading systems for structures will come to the fore; building materials that are reflective and do not retina heat will be used and powerful cooling systems that are powered by groundwater or domestic scale renewables will become more prevalent.